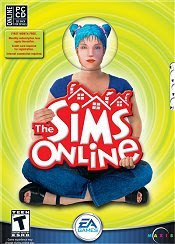 Take your Sims to an online world where you get to be yourself or whoever you want to be. In this world you have your own piece of land to do with as you please. Create a house, coffee bar, dance club, museum, or whatever you can imagine. Explore the neighborhoods around you and meet scores of Sims along the way. Build a network of friends to enhance your power, wealth, reputation and social standing. Be a peacemaker or pest, a recluse or rabble-rouser. In this open-ended, online world, you choose your role, your attitude and your destiny. * Create and customize your Sim: be yourself or whoever you want to be. * Construct a home, a shop, or whatever you imagine in a user-created, on-line world. * Build a network of friends and form shared houses, neighborhoods, businesses and clubs. * Communicate with other Sims through text chat and a wide choice of animated gestures and actions. * Choose your role and play your way in an open-ended gaming environment.